Gant Pécsi Kesztyű Ltd is a maker of high-quality, traditionally hand-tailored leather gloves. Quite surprisingly, even modern technology has yet been unable to devise a method that would match traditional handiwork in glove tailoring – a skill that has been the basis of quality glove making since the end of the 19th century. While certain stages of the manufacturing process are assisted by modern equipment, the essence remains the same: quality raw material, outstanding skill, and handiwork. Leather has been one of the most basic materials for clothing for 5000 years – apparently, it never goes out of fashion. While leather clothing today is primarily considered fashionable, comfortable and useful, leather gloves remain a symbol of distinction and taste. Quality leather gloves need shiny, soft, flexible and thin leather with a smooth surface. Leather is fully natural, and as such, it bears visible marks of its former life. Scars, bite marks and bruises are common on animal skin. We only use leather that has been processed in the most natural ways available. This means a minimal use of dye, which does not coat the surface. This allows the natural texture of leather to show, and, as a result, the finished leather glove also shows a natural texture. Since we apply a very thin layer of dye, light-colored gloves often show slight differences in tone, even within a single leather surface. This is a small price to pay for keeping leather as smooth and soft as it naturally is. Tailors must do their best to avoid surface imperfections. It is also the tailor’s job to choose pieces of leather as close to each other in tone as possible for a pair of gloves. The key to perfect tailoring, however, lies with stretching the leather in the right directions before and during sewing. The result is a perfect fit. Even the simplest design needs a hand, palm, thumb and finger gussets. For a more complex design, 8 or even 10 additional pieces must be cut. After manual cutting, leather pieces are pressed against glove shapes mechanically. A modern press is fully automatic, but the basic idea behind the process is still the one devised by French glovemaker Jouvin in the 19th century. Cutting requires intense focusing – a tailor works only on one piece at one time. For the sake of quality, spreading several layers on top of one another and cutting them together is not allowed. Therefore, the cutting phase takes a long time. 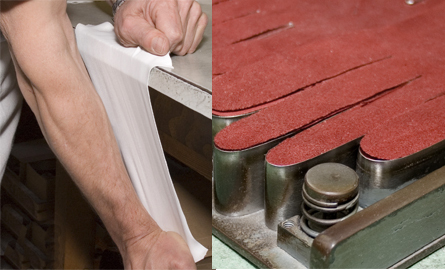 Some manufacturers simplify this stage by spreading the leather instantly on the shape for cutting, as a result of which the finished product will contain less material. A glove made in this way is cheaper, but less comfortable than a traditionally made one.